A seminal figure in the field of public management, Mark Moore presents his summation of fifteen years of research, observation, and teaching about what public sector executives should do to improve the performance of public enterprises. Useful for both practicing public executives and those who teach them, this book explicates some of the richest of several hundred cases used at Harvard's Kennedy School of Government and illuminates their broader lessons for government managers. Moore addresses four questions that have long bedeviled public administration: What should citizens and their representatives expect and demand from public executives? What sources can public managers consult to learn what is valuable for them to produce? How should public managers cope with inconsistent and fickle political mandates? How can public managers find room to innovate? Moore's answers respond to the well-understood difficulties of managing public enterprises in modern society by recommending specific, concrete changes in the practices of individual public managers: how they envision what is valuable to produce, how they engage their political overseers, and how they deliver services and fulfill obligations to clients. Following Moore's cases, we witness dilemmas faced by a cross section of public managers—William Ruckelshaus and the Environmental Protection Agency, Jerome Miller and the Department of Youth Services, Miles Mahoney and the Park Plaza Redevelopment Project, David Sencer and the swine flu scare, Lee Brown and the Houston Police Department, Harry Spence and the Boston Housing Authority. 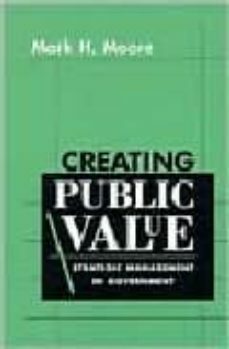 Their work, together with Moore's analysis, reveals how public managers canachieve their true goal of producing public value.